The one constant Bryant Shireffs has been blessed with during his time as UConn's starting quarterback is having a game-breaking talent like Arkeel Newsome to get the ball too. 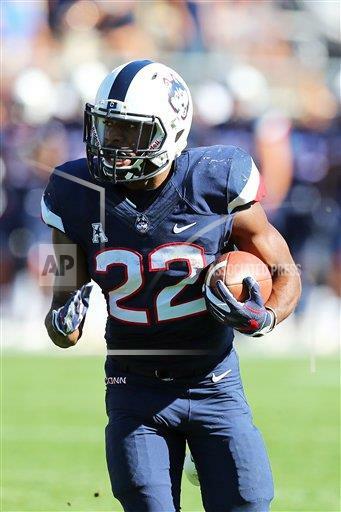 However, Newsome will be out for the next 3-4 weeks for what UConn coach Randy Edsall termed "a clavicle/sternum issue." Newsome is the first UConn running back with 100 career receptions and his final play in the win over Tulsa was a 51-yard reception which put him into second place on UConn's career list for all-purpose yards. Freshmen Nate Hopkins (289 yards) and Kevin Mensah (210) are the No. 1 and 3 rushers on the team so the running game shouldn't take a huge hit with Newsome's absence but it will be felt in the passing game. Newsome is tied for the team lead with 22 receptions and leads the Huskies with 407 receiving yards while the other running backs have combined for nine catches and 61 receiving yards. It's not just the catches that Newsome makes but the fact that opposing defenses need to make certain they knew where Newsome was at all times because a blown assignment against the former Ansonia High School star likely would result in a touchdown for the Huskies. "I would guess defenses would game plan a lot for Arkeel so in that respect, it is not a great thing for us," Shirreffs said. "I believe in the other running backs and the other guys are definitely going to step up. We have an offense where any given week different people can step up, when a big play has to be make you never know who is going to make it." "I am going to miss tossing him the ball and seeing him weave through the defense. It was always a unique angle from my point of view because I would see him pop in and out of defenders. I am sad about it, you don't really have time to sulk about it and get emotional, it is in the middle of the season and it is part of football, sadly we have all been there before. He is a great player, a great teammate and you hate to see that happen because he is a leader on the team." Newsome was on the sideline trying to talk the UConn medical staff to let him get back into the game shortly after getting injured. At one point he dropped to the turf and did some pushups to prove he was OK. As if his teammates didn't already realize how tough a competitor Newsome was, that certainly reminded them. "He is a beast, there aren't many people in the country who have taken the hits he has taken," Shirreffs said. "I know how some of those hits feel and I don't see how he does it because he is considerably (smaller) than me and to see some of the hits he has taken, this injury doesn't really surprise me after all that I've seen. He is one tough player and a tough individual. That is a credit of where he is from, the people who have had influences on him, just his resilience, his size might not be that big but his heart is really big." Hopkins ran for 130 yards and three touchdowns in a season-opening win over Holy Cross but hasn't rushed for more than 38 yards in any game since. Mensah ran for 156 yards and averaged 7.1 yards per carry in his first two games but has 54 yards on 24 carries in the last four games. "Kevin is getting better but Kevin has to relax a little bit, he puts a lot of pressure on himself," Edsall said. "We are trying to get him to do what he is supposed to do. He is one of these kids who wants to be perfect all the time instead of just getting the ball and letting your instincts take over. He is talented enough. Nate is a guy who has gotten better, he has some shiftiness to him, the big thing with Nate is just starting healthy, that is the big thing with him. JT (junior Jason Thompson) will be up there playing so there is a chance that he could get some more time so we will have those three guys going. Those guys have improved but there are little things that they have to continue to work on to get better at." UConn isn't the only team dealing with an injury to a star running back. A shoulder injury will keep Missouri's leading rusher Damarea Crockett from playing in Saturday's game. Edsall said that reserve defensive back John Robinson will not play in the next two games due to violation of team policy. Robinson's absence will be felt more on special teams as he was on return coverage squads than on defense. Also, defensive lineman James Atkins is back at practice so he will add another body as a position that has been hit hard by the injury bug.